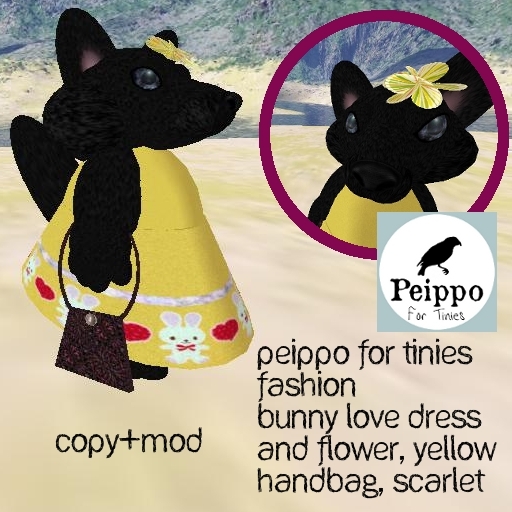 Here is the first ever dress sold by Peippo. Made of Pieni's favorite bunny fabric, it has a tummy piece that works as top and underpants, and the skirt piece. With the dress comes a yellow flower and a beaded Scarlet handbag. The bag has a silver button clip. All items are made of prims by original design. This set will be part of Tiny Swagtastic weekend this week. Get it at Peippo for Tinies at Heron Shire. New location: two swags this weekend! The Dance Under The Sea was a huge success.